While this isn’t a new figurine, it’s been out of stock for a long time. Restocking it clearly shows that there is indeed demand for this beauty. Sure, recently there was some Majora’s Mask hate, but now it’s nice to be rewarded with some Majora’s Mask love. The statue stands at a staggering nine inches tall, and rings in at $99.99. I am definitely adding this beast to my collection. Sorry aussies, it’s all sold out in kangaroo land. What are you waiting for? 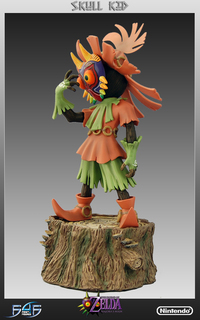 Go buy this must have collectors item for any Majora’s Mask fan.